RSS is now among the indispensable for those who like to read. But it is very important to be able to follow RSS feeds in a practical way. 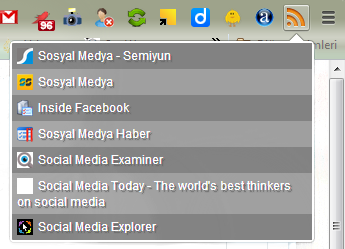 With Chrome's RSS Feed Reader plugin, you can easily track your favorite blogs, news sites or a friend's Facebook notes. Depending on your needs, you can also receive notifications for each new post. Moreover, RSS Feed Reader has 3 different themes. One of the most beautiful features is that you can keep track of the dozens of feeds on a regular basis. Because you can folder RSS, just like bookmarked websites. At the same time you can export your RSS feeds for use on other computers. My RSS feeds from here you can download your computer and import your own scanner.